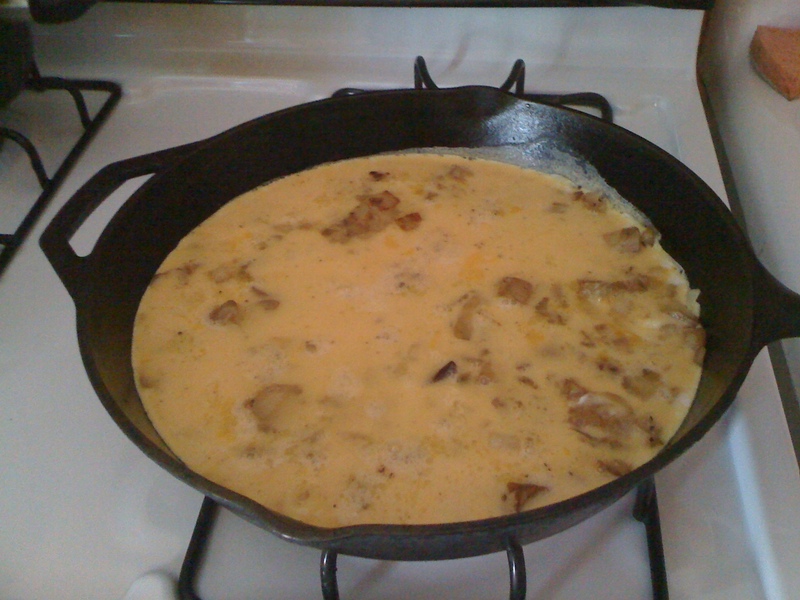 (Kind of) Spanish tortilla | Mom, How do I make this? 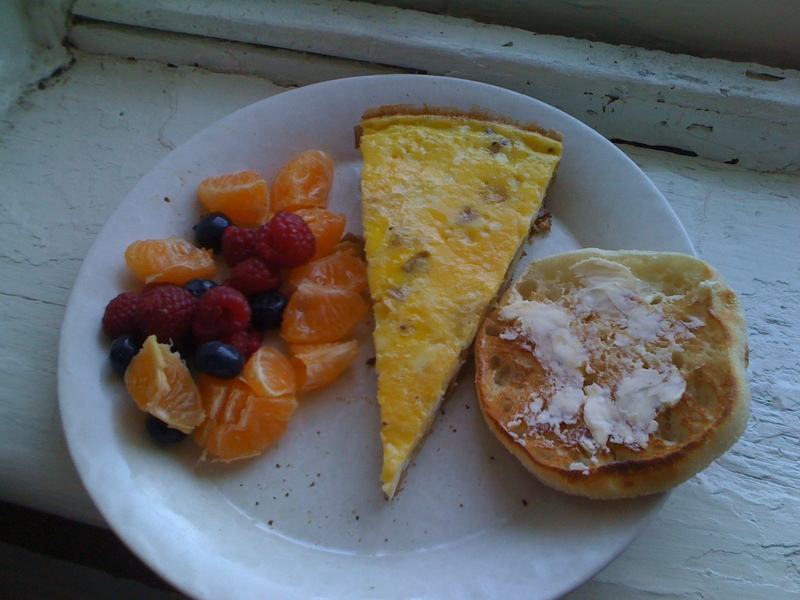 When we had a dinner that involved oven-browned potatoes, the next morning was almost always one of two things for breakfast: potatoes and rice with eggs, or a tortilla. So. damn. good. Later when I went to Spain I learned my mom’s version differs from the traditional type of Spanish tortilla, but it’s still delicious nonetheless. So back off, purists. 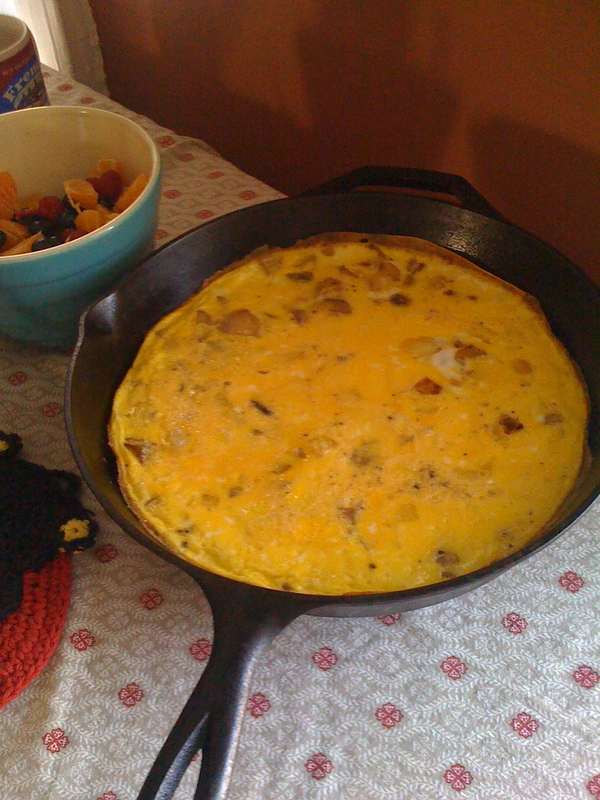 If you have a cast-iron skillet your life is made considerably easier for many reasons, but especially because you don’t have to worry about flipping the thing, which I’ve done successfully on a number of occasions and am available for consult if necessary. But really, this works best. Note the leftovers, as well. If you’re going to make this, cook the potatoes before hand. Cut them small and roast them with olive oil and salt and pepper and garlic or whatever you like. Be sure to save at least a cup for the tortilla. 1 medium onion or 1/2 a big yellow onion. On a medium heat, dice the onion and saute with olive oil until translucent and fragrant. Further dice your potatoes so they are small bits, and coat the bottom of the pan. Let them warm for about 3 minutes. In a large bowl, crack the eggs, and add the milk, beat till they look like scrambled egg batter, then pour over the potato and the onion. Salt and pepper it. Turn the pan down to low and let it cook. You’ll let it cook until the egg is firm, but there will still be runny egg on the top. When the bottom is firm and there’s just a thin layer of runny egg, you finish in the oven for about five to 10 minutes, while you either make the fruit salad I made, or a green salad with arugula, hearts of palm, and avocado and vinegar and oil. Let it sit. This should be eaten at room temperature, or even chilled. The eggs will be spongy. 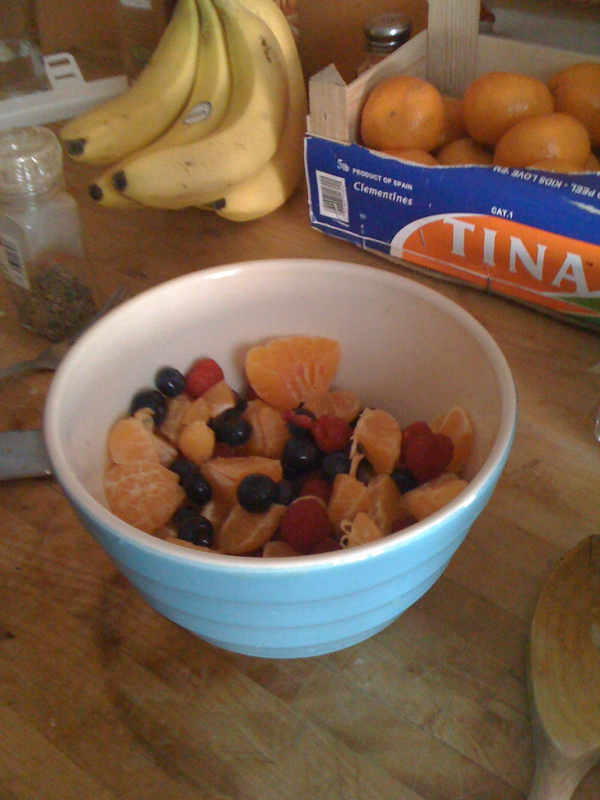 For the fruit salad, I used clementines, blueberries and raspberry. wish i lived closer so you could make this for me!! !